Check out the sign in the photo. 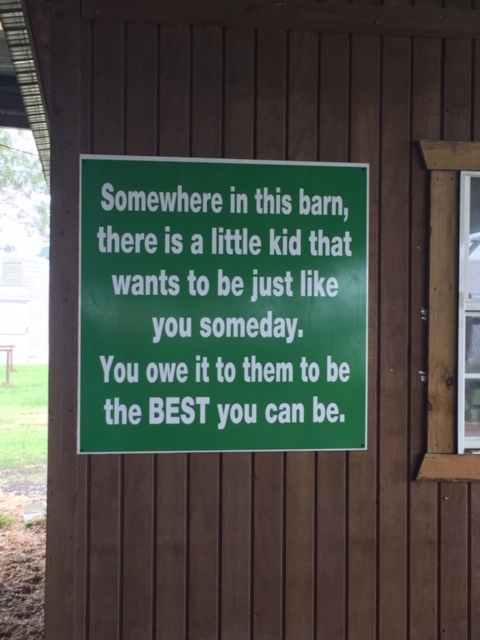 It's hanging proudly in the livestock barn in Beauregard Parish. Great message! Great challenge for the youth who are wandering around the barn, hanging out with friends, making decisions about their behavior! What a great opportunity to stop and realize that every conversation, action, behavior, and attitude is being watched by little ones. The 4-H livestock program is well known for being a family project. Several generations are involved in bringing a 4-H member to a barn along with their animals. Grandpas, grandmas, and grandchildren can be found around bales of hay and beach chairs. Talking and laughing with each other and the family next to them in the barn. By grooming, feeding, cleaning, watering, and caring for the animals with respect. By behaving in a manner that is a good showman while at the show. By losing and winning gracefully, shaking the hands of the other showmen and keeping the true spirit of 4-H in mind going into and out of the ring. By realizing that some families have more or less money and can provide animals for their children based on their income. By respecting the decision of the judges and understanding that by participating in a competition manners are important. My family is a livestock family. My parents were so excited to have grandchildren to start the cycle over once again. When we stepped into the barn they were greeted by friends and it was "old home week" for them.